Organisations face increasing demands when it comes to digitalisation. A comprehensive understanding of the topic, the right strategy for the organisation and very concrete solutions for implementing that strategy are needed. And with new regulations, data protection becomes increasingly complex. The DIGITAL FUTUREcongress is there to help! 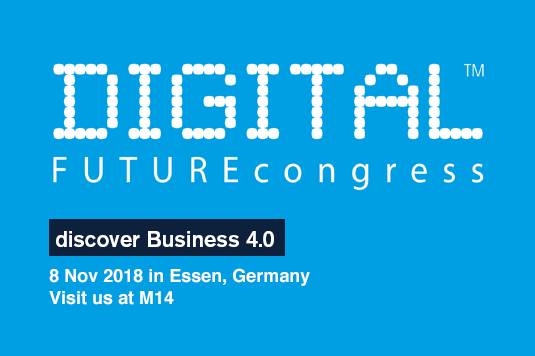 The congress’ motto this year is “Discover Business 4.0 – Mittelstand trifft Digitalisierung” and it offers a full day of hands-on workshops and exhibitions. Participants can discuss their digitalisation strategy with experts, exchange experiences with colleagues and learn from best practice examples. The goal is to take home concrete solutions for implementing the digitalisation strategy at their organisation. The CSCP is respresented at the congress – and we are happy to announce that you can be right there with us! As a German small or medium-sized company or organisation (revenue of no more than 50 million, 250 employees or less), you have the opportunity to win free tickets to the DIGITAL FUTUREcongress. All you have to do is email us before 22 October 2018 with the following information: Name, Company or Organisation, Contact Information, Digitalisation needs. It is crucial that you let us know what you are hoping to get out of your participation, i.e. what your digitalisation needs are. We will select the recipients of the free tickets on that basis. Please email Thomas Wagner and include “Teilnahmeverlosung für den Digital Future Congress am 08.11. in Essen“ in the subject line. The DIGITAL FUTUREcongress is the largest IT Management event within the Ruhr Area. It will take place in Essen for the first time, and more than 3.000 participants are expected. They will learn from more than 120 speakers, panel memebers, workshops and exhibitions clustered around six topics: online-marketing, process optimisation and IT-infrastructure, new work, cyber-security and data security. Find detailed information about the programme and the location here. Please contact Thomas Wagner, if you have further questions.